Summary: Works simultaneously as character study, teen drama and sci-fi thriller seamlessly reconciling these elements into a hugely watchable whole. “Donnie Darko” has got CULT MOVIE written all over it. But before some of you start grimacing (or celebrating), the fact that the accomplishments of “Donnie Darko” as a film (and those of its 26 year old writer-director Richard Kelly, as a filmmaker) should transcend this tag are clear to see. It is just that its esoteric viewpoint of disenfranchised American youth and its startling subject matter and narrative form are not going to be to everybody’s’ taste. That said, it is a film that I believe many viewers will come to cherish as thoughtful, imaginative and moving with a good smattering of the perfect elements that will endear it to a cinema-goer. One specifically who is drawn to a film that stimulates both intellectually and visually, and leaves a lasting emotional mark through its articulation of a number of highly topical themes. We are introduced early on to Donnie’s apparent emotional problems, for which he takes a plethora of pills and sees a counsellor with regularity. Despite this (or perhaps because of it?) Donnie proves to be a creative and articulate person, capable of ruffling a lot of establishment feathers (in the shape of his parents and teachers) but also of great emotional depth. The relatively unknown Jake Gyllenhaal superbly plays Donnie with an initially phlegmatic temperament, which is slowly made more resolute yet disillusioned as the plot advances. Donnie’s life is changed forever one night when he meets Frank, basically a man in a grotesque Rabbit suit, who tells him things (trivialities like when the world is going to end! ), and instructs him to perform certain subversive tasks. Frank’s ambiguous nature, and the frequency of his visits seem to be intrinsically linked to Donnie’s medication. 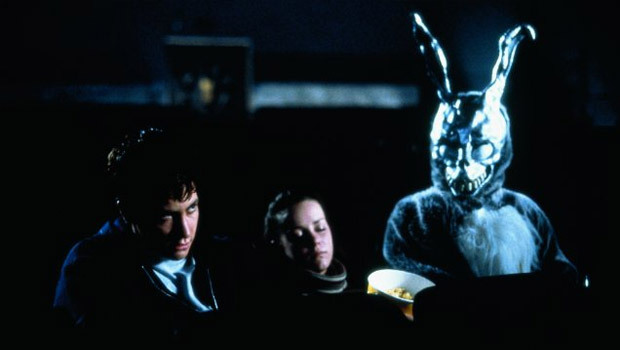 Like the best in David Lynch’s work, “Donnie Darko” juxtaposes the mundane, superficial happenings of a small town and its inhabitants with a strange otherworldliness that exists below the surface and on the periphery, yet sitting comfortably alongside “normality”. Kelly strives to make a similar point to Lynch: notably that everything sitting on the margins, does so because it was forced there through suppression by the mainstream powers-that-be (High school, the church, etc) the very restrictive institutions that created these undercurrents in the first place, and that these repressions WILL RE-EMERGE. Many of Donnie’s problems, and eventual triumphs, are linked to his inability to accept the status quo (against which he protests) and their efforts to control him, through punitive action, and prescription drugs! To underline these latent irregularities Kelly prepares an extremely visual canvas. Interesting, yet not overcooked, effects are used sparingly to illustrate Donnie’s increasingly confused state of mind. Aside from the dirty great rabbit, that inconveniently keeps appearing, Donnie becomes aware of invisible barriers and large transparent bubbles emerging from the midriffs of his nearest and dearest; he is understandably concerned! The effects serve to bolster what is already a good story, with an unnerving and slightly irregular edge; they never detract from the specifics of the plot by being overused, as is so often the case with contemporary Hollywood. The supporting players are all watertight if somewhat restrained, naturally allowing Gyllenhall many of the best lines of a very effective script. Drew Barrymore and ER’s Noah Wyle are the sympathetic teachers who try to understand Donnie’s predicament, and a rebranded Patrick Swayze (I suppose you can’t go on making TV dancing movies forever?) is the sleazy self-help guru who arouses Donnie’s suspicions. Particular praise should be given to Mary McDonnell as Mrs Darko; portraying a loving mother who seems unable to understand or deal with her sons’ problems. She comes across as simultaneously caring, blasé, jaded and extremely vulnerable. Gyllenhaal’s actual sister Maggie replicates her real-life role in the film with an understandably inherent naturalism. “Donnie Darko” is a fresh vision, and a bang up to date analysis of the state of the American nation today, despite the fact that it is actually set in 1988. It tackles the teenage experience with confidence, wit and maturity and highlights the tug of war that goes on in these formative years between very visceral and immediate emotions. Donnie is trapped between understanding his potential importance (for himself and those around him) and not being able to fully achieve it, the almost sci-fi derived generic elements of the story act as metaphors for this coming of age story, which is articulated in a visually complex and exciting way. It is an important and enjoyable movie, which combines a variety of carefully perceived aims and follows them through to completion. It works simultaneously as character study, teen drama and sci-fi thriller seamlessly reconciling these elements into a hugely watchable whole.